How to Connect a Laptop to the Printer Wirelessly in Windows 10? 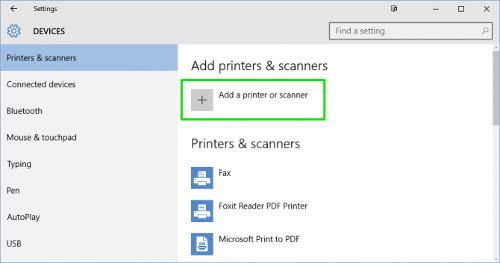 How to Connect a Laptop to the Printer Wirelessly in Windows 10, all you need is a high speed Wi-Fi connection, printer, and a computer. The wireless printer will allow for remote access without being physically attached to the unit. Unpack your printer, turn it on and install the cartridges. Unpack the printer from the package. Follow the setup instructions to remove packaging. Link the power cord, turn on the printer, and install the cartridges. Disable the USB or Ethernet connection. In printer set the initial language, and load paper in the tray. Use a secure connection for the Wi-Fi setup. Select your Network from the setup menu. Click on the name of your printer, and follow the on-screen instructions. Once you unbox the printer, plug in the power cord, turn on the printer and install the cartridges. After completing the setup, select the initial language from the options, and load paper into the input tray. The main screen opens; you will see copy, scan, and print jobs. Just use your finger to scroll to the end of the catalog at the right. You will see the Setup option at the end. Click Setup, scroll down the setup list and touch Network Setup. You will find the Wireless menu on the top of the list, Touch it, and then select Wireless Setup Wizard. Now follow the on-screen instruction to select your network. Once the network gets connected, add the printer to your laptop. On your Windows 10 computer, go to the Devices & Printers option, and type Printers in the search bar to open it. Device & Printers will appear in the list, click on it and select Add Printer. It will display a list of printers, find your printer, and click on it. It prompts you for a WPS PIN, which is used for security purpose. Go back to the Printer; it will display the PIN on the screen. Type the PIN into your computer’s Enter the WPS PIN for your printer window, and click Next. Now the printer gets installed. Try to print a test page to make sure everything is set up properly. Right-click on the printer, select Properties and click Print a Test Page at the right. Now the printer prints the test page. You can also print wirelessly without a wireless router. HP wireless direct & Wi-Fi Direct are used for this type of connection. Turn on HP Wireless direct or Wi-Fi Direct from the printer’s control panel. Make sure the Wi-Fi is on and then connect to the HP Wireless Direct. Proceed with the on-screen instruction to set up the printer. Install the Printer software on your computer, and then choose the Wireless for connectivity option. If you have any problems form How to Connect a Laptop to the Printer Wirelessly in Windows 10 system contact with our tech team.